Have questions? Search the following frequently asked questions to determine if your question has already been answered. If your question has not been answered or you would like more information then use our contact form. But please check here first! I found an orphaned or injured opossum. What should I do? How do I locate a wildlife rehabilitator? Are opossums related to rats? Can I keep an opossum as a pet? Can I raise a baby opossum and release it into the wild myself? I have been raising an opossum since it was a baby. Now it can’t walk. What is wrong? There is an opossum in my yard. What do I do? There is an opossum in my house or garage. What do I do? How do I keep opossums out of my home and garage? There is an opossum in my attic or under my house or deck. What do I do? How do I trap and relocate an opossum? I saw an opossum on the road. What should I do? I think there is a dead opossum in my yard. What do I do? How do I prevent an opossum from drowning in my pool? Opossums make my dog bark! My dog kills opossums. What can I do? A neighbor kills or tortures animals. What can I do? I see an opossum sharing a food dish with my cat. Is this normal? Will opossums attack my pets? Will an opossum bite my children? I heard horses could get EPM from opossums. True? Opossums eat the fruit off my trees. How can I stop them? I think opossums are digging holes in my roof or yard. If opossums are nocturnal then why do I see one in the day? What sounds do opossums make? Can I get a disease from an opossum? Can I get Murine Typhus from an opossum? I sent an email and an attachment but it was not answered. Why? I would like more information about opossums. Question: I found an orphaned or injured opossum. What should I do? Answer:First, we would like to thank you for helping the opossum. Second, please read the section titled “Found an Orphaned or Injured Opossum?” for information about what to do next. For help locating a wildlife rehabilitator near you please see the nest question and answer. Question: How do I locate a wildlife rehabilitator? Answer: If you live in Orange or Los Angeles Counties in California then contact your local animal shelter and ask for a referral to an O.S.U.S. volunteer. Outside of these areas you can contact your local veterinarian, animal control or your state’s department of wildlife for a referral to a rehabilitator near you. Please ask and make sure they do not have a policy of euthanizing all opossums! We will be happy to assist you in locating a wildlife rehabilitator by email if you provide your city and a list of cities near you. Please be advised that we are volunteer based and so there may be delays in answering email. If immediate assistance is needed then do not wait for a response from O.S.U.S. Question: Are opossums related to rats? Answer: No! Despite their rat-like appearance, opossums are not related to rats at all. Opossums are marsupials, or pouched mammals. Marsupials carry young in a pouch on the abdomen of the female. Relatives include the koala and kangaroo. The opossum holds the distinction of being North America’s only marsupial! Question: Can I keep an opossum as a pet? Answer: No. All wild animals belong in the wild. Give the opossum the chance to live the life nature intended…in the wild. In most states it is illegal to be in possession of a wild animal without the proper permits. If the opossum is an orphan or injured then seek immediate assistance. Read the “Found an Orphaned or Injured Opossum?” section. Otherwise, release the animal. Also, read the information in the next two sections for more reasons why you should not attempt to raise it unless you are properly trained. Question: Can I raise a baby opossum and release it back into the wild myself? Answer: It is not in the best interest of the animal and it is illegal, in most states. Raising wild animals is not the same as raising a puppy or kitten. If not fed the proper diet or if early signs of illness are not recognized then the opossum will suffer and possibly die. Remember, they are wild animals. They will not show you when they are sick, as a dog would. This does not mean we do not want you to raise opossums, only that you must be properly trained first! Contact OSUS or a local wildlife rehabilitator for volunteer opportunities. Question: I have been raising an opossum since it was a baby. Now it can’t walk. What is wrong? Answer: This is a common problem occurring all too frequently when the well-meaning but untrained public tries raising wildlife. Most likely the opossum is suffering from a diet-induced disorder. The opossum may have what is known as Metabolic Bone Disease (MBD), also known as rickets, osteomalacia and secondary nutritional hyperparathyroidism. Opossums have specific dietary needs which must be met or crippling and/or life-threatening disorders will develop. MBD is preventable! If the opossum does not receive an adequate amount of calcium and in the correct calcium to phosphorous ratio then MBD is highly likely to be the cause. Common signs of MBD include weakness, anorexia, inability to grip, unable or unwilling to move, a bowlegged or “frog-like” appearance, brittle and easily fractured bones, bone deformities, swollen joints and a “rubber jaw”. In more severe cases the internal organs will be affected and death may occur. Contact a local wildlife rehabilitator or veterinarian immediately. The opossum must be properly diagnosed and then receive a correct diet in additional to any necessary treatments and supportive care. Question: There is an opossum in my yard. What do I do? Answer: Nothing. Leave it alone. If it is injured or orphaned then read the “Found an Orphaned or Injured Opossum?” section. Otherwise, enjoy watching wildlife in your own backyard! Opossums are beneficial: eating the harmful, unwanted pests around your home such as snails, slugs, spiders, cockroaches, rats, mice and snakes. Think of the opossum as your free gardener. The opossum is known as “Nature’s Little Sanitation Engineer” for a good reason! Opossums are transient, only spending 2-3 days in the same den site, then moving on to their 2nd, 3rd, and 4th den sites. They do keep a consistent foraging route and may be seen at the same time each night lending to the misconception they are living in your yard. Both males and females will create elaborate nests for their 2-3 day stay to conceal themselves from predators. If you can’t tolerate being one of their many sleeping sites, just tear apart the nest at dusk and they will move on to other sites along their route. Mother opossums carry their babies in their pouch, so it won’t be a problem. Question: There is an opossum in my house or garage. What do I do? Answer:First contact your local animal shelter to determine if an officer will assist you. Always make sure the opossum will not be trapped and killed! An opossum can safely be trapped by leaning an empty, tall kitchen trash can at approximately a 30-45º angle against something the opossum can climb onto such as a stack of books. Place cat food or ripe fruit at the bottom of the trash can. The opossum will be able to climb into the trash can but will be unable to climb or jump out. Immediately take the trash can outside. Tip the can on its side and the opossum will leave when it feels it is safe to do so. This is best done at dusk. If it has to be done during the day then tip the opening towards a dense shrub where the opossum can hide until nightfall. You can also try to leave a trail of pet food leading to an open door. Observe quietly at a distance. Once it leaves, shut the door. Do not try to push the opossum with a broom. The frightened animal will freeze and not move. Question: How do I keep the opossums out of my home and garage? Answer: Close all doors, pet doors and unscreened windows from dusk to dawn. Put food away so that the opossum will not be tempted to enter. Question: There is an opossum in my attic or under my house or deck. What do I do? Answer: First you must locate the access hole(s) the opossum is using to get under or into your house, or under your deck; check all vent screens. Then purchase and have the material handy to replace or repair the screen, stucco, wood or other material that is in disrepair. There is no need to exclude the opossum if you aren’t going to correct the attraction. Wad up and lightly stuff newspaper in the breach of the hole. Sprinkle a layer of flour around the entrance. Wait for the opossum to leave at night. Opossums are nocturnal and will leave shortly after sundown to hunt for food. Check frequently for the newspaper to have been pushed out and for tracks in the flour leading away from the hole to ensure the opossum has left. Once it leaves, seal the entrance thoroughly if you cannot immediately complete the repair at that moment. If you see tracks returning to the hole then do not seal; there is an animal in there. Make sure there are no young left behind before sealing or the animals will die. It is best if you can wait until the non-breeding season (usually October to December) before sealing an area in order to give the young a chance to leave. Remember, if an opossum should become trapped after an area is sealed you will end up with an awful smell and additional expense removing the seal and then resealing after the body is removed. If the opossum is using a tree to access the hole, cut the branch away from the house after the opossum leaves. Opossums cannot jump so trim back enough just so they can’t reach by stretching. Allowing branches of trees to touch your house also gives bugs access to your roof area which will attract the opossum and other animals as a food source. You must keep up your house in its originally pest-proof state. Not doing so will provide (or maybe is already providing) other animals to seek refuge including: skunks, raccoons, mice, rats. If your home is so old that it was never built to exclude animals, contact your local pest control for them to come out and “pest-proof” your home by exclusionary methods. Most pest control companies will humanely trap and release large mammals from your property also. Ask them what they do with the animals before you enlist their services. Refer to the links at the end of the following question for Humane Trappers and Exclusionary Services. Question: How do I trap and relocate an opossum? Answer: Do not trap! Opossums are normally transient animals, staying only 2-3 days in an area before moving on. Removal is neither necessary nor desirable. If opossums were eliminated from an area, the population of roof rats and other pests would proliferate. Opossums serve an important role by controlling the unwanted, harmful pest population around our neighborhoods. So now we should ask you a question. After learning about the benefits opossums provide, why would you want to trap and remove an opossum? Trapping and relocating does not work. If you are determined to remove an opossum then encourage it to do so on its own by removing whatever is attracting it to your area. You must determine what is attracting the opossum to your area and remove the attractants or other opossums and animals will come and fill the vacated niche. Opossums are usually attracted by pet food left outside and dense shrubs to hide under. · Do not leave garage doors, pet doors or unscreened windows open at night. · Do pick up fruit that has fallen from trees. · Do cover garbage cans at night. · Do clear dense bushes, woodpiles and other hiding places. If you are determined to trap then please contact a humane trapper. Make sure the opossum will be trapped safely in a humane trap AND released unharmed. Please do not trap during the spring to fall baby season or animals may become orphaned and die. The following referrals can remove healthy opossums from dwellings. THEY DO NOT TAKE CARE OF ORPHANED AND INJURED OPOSSUMS. Question: I saw an opossum on the road. What should I do? Answer: If safe to do so, pull over and move the body to the side of the road. If alive then seek immediate assistance. If it is a deceased female then check the pouch for any live young. If found then wrap in a soft, ravel-free towel and transport to a wildlife rehabilitator immediately. Young opossums can not survive long outside the pouch environment. For more information read the “Found an Orphaned or Injured Opossum?” section. Question: I think there is a dead opossum in my yard. What do I do? Answer: Give the opossum the benefit of the doubt. It may not be dead! Many opossums will “play ‘possum” when extremely frightened. They will appear dead. If found then leave the area, put dogs in the house and give the opossum a chance to recover. It may take anywhere from a few minutes up to 4 hours. Generally, the ears will start to wiggle when the opossum is about to revive. Please do not immediately place the opossum in a plastic bag or garbage can. If after 4 hours there is no movement or signs of life then contact animal control for disposal. For more information or to see an actual photo of an opossum “playing ‘possum” read the “Opossum Defense Mechanisms” section. Question: How do I prevent an opossum from drowning in my pool? Answer: Many opossums fall into a pool as they attempt to drink water. If unable to climb out then the opossums will drown. There are several things you can do to prevent drownings. If possible, keep swimming pools and hot tubs covered at night. Also, try placing a bowl of water nearby so that the opossum will not be tempted to drink from the pool and fall in. Make “opossum pool ladders” by draping 12 inch wide small mesh netting, towels, or other easy to grip item over the side of the pool. Attach these items to the top of the pool by tying to a pool ladder, tree or other firmly anchored item or clamp to the side of the pool. Sinkers or a weighted object will help hold the opposite end of lightweight mesh netting under water. Place several “opossum pool ladders” around the pool, at least 1 every 3 feet. You can also place 2 inch by 4 inch planks of wood in the pool, leaning out onto the side of the pool. Styrofoam kick boards or rafts can also be placed in the pool. The opossum may be able to climb on one and float until found. You can purchase a Skamper Ramp device on the Internet through Amazon, Nextag, etc. View information on the Skamper Ramp at www.Skamper-Ramp-Store.com Or visit your local PetCo to purchase a Skamper Ramp. Question: Opossums make my dog bark! Answer: A dog will bark at anything it sees or hears. The best thing you can do for the opossum AND your neighbors is to train the dog or keep the dog indoors at night. This will prevent the dog from injuring or killing the opossum. If not possible then confine to the garage or a run. Also, read the answer below. Answer: An opossum won’t poop all over the yard, it will poop in a secluded area (they don’t like to be out in the open at all) surrounded by at least two shields. They like to poop in piles of leaves or other rotting foliage, they also tend to poop right after they eat or drink, so if there’s a food or water source left out in your backyard all night, they would be attracted to it. Keep your yard clean of leaves and debris. Keep the opossum from entering your yard at all. Keep all trees and shrubbery trimmed away from the fence. Don’t leave out any food source or fallen fruit from trees. Make sure your sprinklers come on just after dawn (optimum time for plant absorption anyway) so that no water is pooled up around the sprinkler head for opossums to use as a water source. Some people have suggested placing mothballs around, mothballs are toxic and if left outside will seep into the soil and into the ground water system, polluting the environment. I have heard of people having success leaving “predator feces” along their fence line, so opossums will not enter their yard. Visit your local zoo or animal exhibit and ask for a small amount of fox, coyote, mountain, bobcat, etc. feces to strategically place in access points to your yard. Question: My dog kills opossums. What can I do? Answer: Keep the dog indoors at night. This way the dog will not be able to injure or kill the opossums. Take the dog outside on a leash to do his “business”. If not possible to keep the dog indoors, then confine the dog to the garage or a run from dusk to dawn. If again not possible, then place a few large PVC pipes (8 inch diameter, 5-6 feet in length) in the yard. This will provide the opossum with a place to escape, should an attack occur. Remove pet food and other attractants from your yard to encourage opossums to move on. Question: My neighbor kills or tortures animals. What can I do? Answer: Whether it is an opossum, a dog or a cat this is animal abuse and is illegal. Please report the incident to your local animal control, police and your state’s department of wildlife. Follow up. Be persistent if you have to. OSUS will be happy to assist you. However, the initial complaint must be filed by you, the witness. Question: I see an opossum sharing a food dish with my cat. Is this normal? Answer: Opossums are very opportunistic animals. If food is available, they will eat. We receive numerous pictures of opossums sharing a bowl of cat food with an outdoor cat. Adult cats and opossums seem to tolerate each other. Feeding wildlife is not recommended. Question: Will an opossum attack my pets? 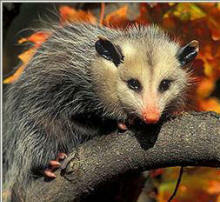 Answer: It is more likely that a dog will injure or kill an opossum. A cat may attack and kill young rat-sized opossums. Adult opossums and cats seem to have a mutual respect and leave each other alone. In general, opossums are docile, non-aggressive animals and will not attack your pets. They prefer to escape and avoid confrontations, if possible. If not, the threatened opossum may “play ‘possum”, show its teeth, or bite in self-defense, as any animal would. Question: Will an opossum bite my children? Answer: Children should be taught not to attempt to feed or touch a wild animal. Opossums are nocturnal, that is they sleep during the day and come out at night, so the chance that a small child will come into contact with an opossum is slim. Opossums prefer to sleep in dark, secluded places. If your children play in this type of an area then there is greater danger of being bitten by a poisonous spider or snake. Question: I heard horses could get EPM from opossums. True? Answer: Equine Protozoal Myeloencephalitis (EPM) is a neurological disorder caused by a parasite. The opossum and a parasite called Sarcocystis neurona have been implicated although current research suggests other hosts and other parasites may be involved in disease transmission. The infective form of the parasite is passed in the feces. If a horse eats contaminated feces then it could develop neurological signs. It should be noted that the majority of opossums are probably not shedding the infective parasite and that of the horses exposed to the parasite, very few will develop EPM. There are steps you can take to reduce the risk of EPM. Keeping all animals away from horses is advised. Do not kill or trap opossums. This will not work. Unless you remove what is attracting opossums and other animals to your yard then more animals will come. The best thing to do is to encourage animals to leave the area on their own by removing the attractants. This is usually food. Do not leave food outside. Do not leave food for the barn cats at night. Feed cats during the day. Cover garbage cans. Pick up fallen fruit. Cover horse’s feed and grain bins. Do not allow horse to feed off the ground. Place feed in troughs above the ground. Change water frequently. Remove animal hiding places such as dense shrubs and woodpiles. Question: Opossums eat the fruit off my trees. How can I stop them? Answer: Opossums prefer to eat the rotting fruit that has fallen to the ground. Keep opossums out of fruit trees by cutting branches away from the ground, fences and roof. Cover the trunk with heavy plastic sheets or thin metal sheets obtained at hardware stores and secure with duct tape. This will prevent the opossum from climbing. A cut-up plastic trash can will work. Question: I think opossums are digging holes in my roof or yard. Answer: The damage is not likely to be caused by opossums. Opossums have soft, delicate hands with nails that are easily ripped out. They are not capable of doing a lot of digging. Other animals are more likely to be causing the damage. Opossums are very opportunistic animals and will often move into a hole created by another animal. The opossum is often the animal observed and assumed to be the cause of the holes. Please see our Opossum Paws page for pictures and more information. Question: If opossums are nocturnal then why do I see one in the day? Answer: There are a number of reasons for opossum sightings during the day. If it is winter in an extremely cold area, usually covered with snow, then the opossum may be hungry. It is often difficult for an opossum to find food in extremely cold, snowy areas. During sever weather the opossum may stay in a den a few days until hunger drives it out of hiding. The opossum may have to forage for food during the day, often while it is warmer. During the spring or summer months a female opossum laden with young must spend more time foraging for food and may be seen during the day. Also, an opossum’s daytime hiding area may be disturbed, often by the presence of a dog or children throwing a ball into a bush. The frightened animal will run out and search for a new hiding place. Other possibilities include a blind opossum or a sick or injured opossum. If you suspect the opossum is not healthy then contact a local wildlife rehabilitator. Question: What sounds do opossums make? Answer: Opossums make few sounds. You may hear a “choo choo” or a sneezing sound. These are sounds made by the young when separated from the mother. The mother will make “clicking” sounds with her tongue in response to the calls made by the young. Also, male opossums will make the same “clicking” sound primarily during mating season. In addition, when an opossum is threatened it can make some low growling or hissing sounds. Sometimes you may a lot of growling and hissing and see one opossum is biting another or on top of another. They are probably not fighting. They may be mating. Question: Do opossums carry rabies? Answer: Any mammal can get rabies. However, the chance of rabies in an opossum is EXTREMELY RARE. This may have something to do with the opossum’s low body temperature (94-97º F) making it difficult for the virus to survive in an opossum’s body. Question: Can I get a disease from an opossum? Answer: A zoonotic disease is a diseased passed between animals and humans. There are diseases you can get from any animal, including pets. As long as you exercise common sense then the chance of getting a disease from an opossum is slim. Do not attempt to pet or get too close to the opossum. As mentioned in the question and answer above, rabies is extremely rare in the opossum. Question: Can I get Murine Typhus from an opossum? Answer: Murine Typhus is carried by the cat flea (C. Felis), so named because worldwide the flea host of choice is the cat. The flea has expanded its range to dogs, opossums, rats, mice and other animals. The cat flea rarely exchanges hosts, so it stays on the animal until the host’s death. One should never handle dead wildlife directly. One should spray their clothes liberally with flea repellent and use a shovel to lift and transport any animal to a burial site (if allowed by law in your city, county), into a plastic bag and secure it, or call Animal Control for disposal. Then liberally spray the area where the dead animal lay with insecticide. While C. Felis doesn’t really care for humans as hosts, starving fleas will jump off the dead host onto anything to drink their blood. Question: I sent an email and an attachment but it was not answered. Why? Answer: EVERY email is answered! Your comments and questions are important to us. Most emails are answered within 24 hours. If you have an emergency situation regarding an orphaned or injured opossum then please do not wait for us to get back to you. Contact a local wildlife rehabilitator immediately. If you have waited several days without a response then the problem may have been an error with the email network. Occasionally answered emails are returned to us undeliverable. Please try again and make sure you have no email blocks. We are a volunteer organization so occasionally there may be delays in responses. Your patience is appreciated. Question: I would like more information about opossums. Answer: No problem! 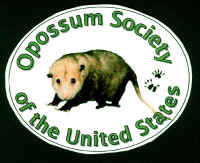 Join the Opossum Society of the United States (O.S.U.S.) and receive valuable opossum information in addition to a number of volunteer opportunities. Check out other informative pages on our web site. Question: How can I become a licensed wildlife rehabilitator? Answer: If interested in becoming a licensed wildlife rehabilitator then contact your state’s department of wildlife for information about requirements and obtaining permits. Rules and requirements vary by state. Make sure you have the financial means, space, time and dedication before making the commitment to enter the wildlife rehabilitation profession. Gain valuable hands-on experience and knowledge by volunteering with a local wildlife organization or individual wildlife rehabilitator.